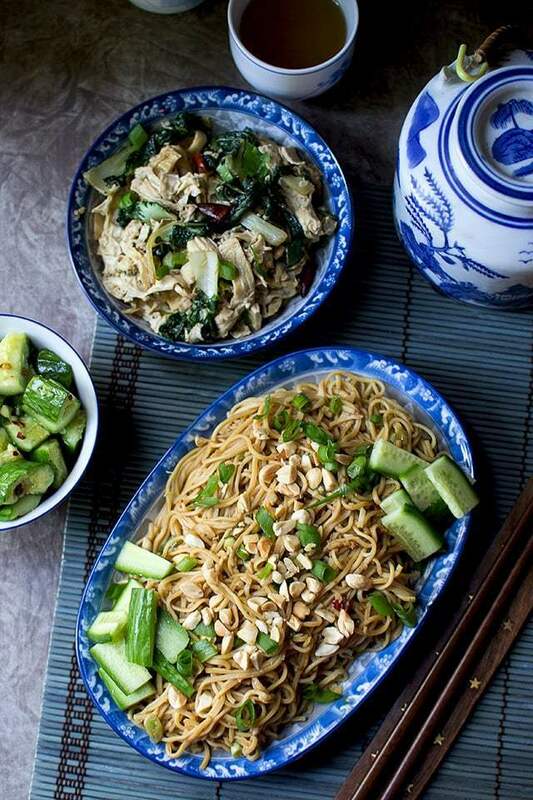 Chinese Cold Sesame Noodles is a very simple dish made with a no-cook sauce. All the ingredients are mixed into a sauce and tossed with the cooked noodles. Cook noodles according to package instructions. Drain the water and rinse with cold water. Add a splash of sesame oil and toss to coat the noodles. In a small bowl, combine sesame oil, soy sauce, rice vinegar, sesame paste, peanut butter, sugar, ginger, garlic, chile-garlic paste and salt. Whisk well to combine the ingredients. Pour the dressing over cooked noodles. Toss well to evenly distribute the dressing. Garnish with cucumber and chopped peanuts and serve.